Presentation of tools and techniques for the better understanding and support of students’ (of different school ages) right in an opinion, in a context of mutual respect and cooperation, through cinema and the rest of the arts. Teachers will be asked to participate in small-group activities of a simulating nature and exchange ideas and views about the process they participated in, as well as about further projects and actions they can implement at their schools. A meeting aiming at practicing a dramatist view upon the world and things in general. At spotting the human drama behind and beyond the mechanisms of everyday life. At reinventing it and recreating it on stage. As a theatrical play. Three-day seminar on the development of drama games in elementary, as well as nursery school. The workshop focuses on the following sections: a) Seeking the definition of drama game, b) The value of the game, c) The game as a basis for the emergence of a role and the creation of improvised theatrical plots, d) Music, movement and dancing in drama game, e) Development of a theatrical game with a beginning, a main body and an ending. At the end of the workshop, a shared activity by students and teachers will take place, with no audience. Seminar aiming at approaching the specific historical period for teachers in secondary education, mainly philologists. Using historical texts, works of literature and theatre, documentaries and films, the author presents different approaches to the subject. The group works on one of them, in order to create a different theatrical play. The seminar draws from the opportunities offered by the analytical Gymnasium and Lyceum programmes for occupation with the subject, so as to expand the means and perspectives while forming tangible and applicable proposals exploiting the possibilities. The workshop begins with the screening of the film “Dans les premiers pas d’une classe Freinet” (Delphine Pincon, France, 50΄, 2014). Brainstorming will follow on the correlation between the classroom, the schoolyard and the community, differentiated instruction, school architecture, correspondence, the class board, a work plan and other Freinet techniques. The workshop is all about printing work (small books, school newspapers, no more reading books, posters, bulletin board, wall newspaper, free expression, theatre-newspaper) and is based on children’s rights (articles 12-17), the production of a public sphere in school, mass media and children rights, child journalism and citizenship in childhood. In the first part, the journey of a children’s book from its birth to its publication and finally to it meeting the hands of children is presented. The second part includes the presentation of practical instructions: What can I do with a fairytale? How to I present it to children? How do I add music to it? How can I make simple music instrument with found objects? How can I use them? Teachers will create their own fairytales in groups. Olympia Film Festival honors author Sofia Zarabouka. Presentation of the historical novel by Alexandra Mitsiali about Axis Occupation and the Resistance, the decimation of the Jews in Thessaloniki, and the Barefoot Battalion, a group of children that struggled to survive while resisting Nazism. Authors Sofia Zarabouka, Manos Kontoleon, Aggeliki Darlasi, Alexandra Mitsiali, Grigoris Chaliakopoulos, Thodoris Papaioannou and Alexandros Stefanidis, visit more than thirty schools in the regional unit of Elis and discuss books, reading, literature and the problems of our times with students and teachers. Soul, funk and rock concert with «BEEZTHREEZZZ» group. Giorgos Menegakis aka Menegator, guitar, vocals, Dimitris Karatzas aka Zacko, trumpet, cajon, vocals, Eleni Kalogianni aka Kapa2, vocals. With the participation of Efi Papadopoulou (soprano) and Panagiotis Kribas (classical guitar) with covers of opera and modern songs, for voice and guitar. With the participation of Dimitris Kompostiotis (guitar) and Eleftheria Tsakoulogiannopoulou (violin) from “Polytehno Music School”. Award ceremony for the 19th Olympia Film Festival and the 16th Camera Zizanio. Poster exhibition with the works of students from various schools in the country, for the Pan-Hellenic Poster Competition for Students of Secondary Education 2015-2016, hosted by the General Secretariat for Gender Equality in order to raise young people’s awareness on the subjects of gender equality, the fight against stereotypes and the promotion of meaningful communication among people regardless of their gender, as a condition for a democratic society. The competition entitled “Building Gender Equality by means of creation against stereotypes” was addressed to students of secondary education. 199 schools (Gymnasiums, Lyceums) from all over Greece took part in the competition, 16 of which came from the Western Greece region. The students of the first three schools participated at an educational visit to the European Parliament (Brussels) in July 2016 as Member of the European Parliament Mrs Konstantina Kouneva’s guests. Shared activity by students and teachers at the end of the experiential workshop for the educators from Amaliada. Participatory activities of drama game and theatrical expression, adapted for special educational needs. Participatory activities of drama game and theatrical expression with environmental subjects, adapted for toddlers. Game activities and activities of theatrical expression, as well as short narrations from the books “My name is Niloufer” and “I want to tell you the truth” by Alexandra Mitsiali, and “Black sky with pink clouds” by Kostas Haralas for pupils of the first grades of elementary school. Activities with pupils of the last two grades of elementary school, as well as the first and second grades of Gymnasium, inspired by “Badboy” by Aggeliki Darlasi. 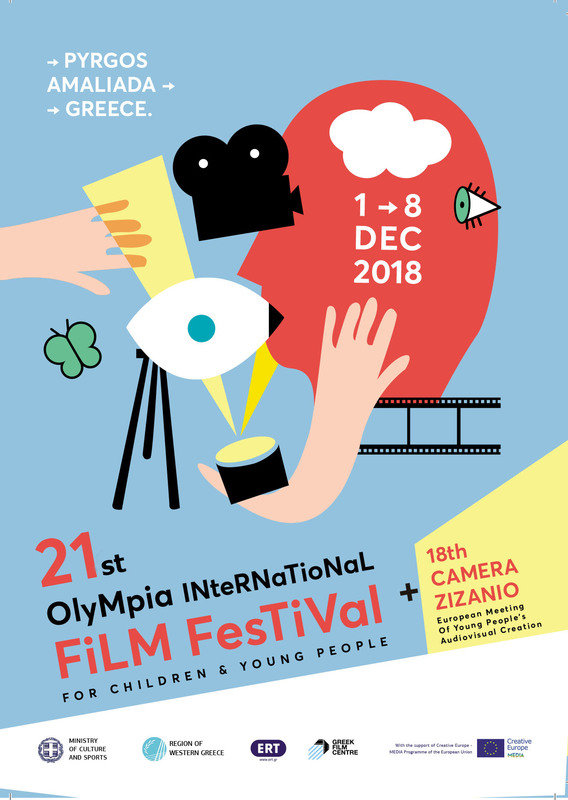 The guests of 19th Olympia Film Festival and the 16th Camera Zizanio have the chance to go sight-seeing in historic and archaeological sites, get to know the place and its monuments, meet people, see their way of life, and also enjoy local hospitality and the products of the land of Olympia. The Cultural Club «Dexameni» hosts a Greek night at their venue, with traditional music, folklore dances and local treats made by the club’ s members, for the guests of 16th Camera Zizanio.